Partners said it expects to occupy up to 700,000 square feet at Assembly Row. Partners HealthCare System, in a move that has infuriated Mayor Thomas M. Menino, said Thursday it will merge administrative operations in the Boston area, relocating 4,500 nonhospital employees into a giant office complex opening at Somerville’s Assembly Row in late 2016. Menino said he had urged Partners executives for the past four months to consolidate on a parcel in Roxbury. The mayor said he was told by Partners chief executive Gary L. Gottlieb Wednesday that the health care group had not made a final decision, only to learn a day later it had settled on Somerville. Menino, who will step down from office in January, said he intends to appeal the move to the Partners board. Partners vice president Rich Copp would not comment specifically on Gottlieb’s conversation with Menino, but he acknowledged Partners — the state’s largest hospital and physician organization — had worked with city officials to explore potential sites in Boston. “The decision was based on creating a more effective and efficient work environment for our employees and reducing costs,” Copp said. He said the consolidation of 14 sites is expected to shave Partners’s costs by about $10 million a year. Partners began searching for a central administrative site because most of its leases at nonhospital locations are set to expire between 2016 and 2018. While the health care system will move out of sites in Charlestown, Wellesley, Needham, and elsewhere, its corporate headquarters, now in the Prudential Center, will remain in Boston, said Copp. The shift to Somerville will reduce Partners’ overall space in Boston by only about 7 percent, he said. In addition to the corporate offices, that space includes Massachusetts General and Brigham and Women’s hospitals, as well as Brigham-affiliated Faulkner Hospital and Spaulding Rehabilitation Network sites. Partners also owns Neighborhood Health Plan and runs administrative offices and research labs in the Longwood Medical Area and Charlestown. Boston’s loss will be Somerville’s gain. 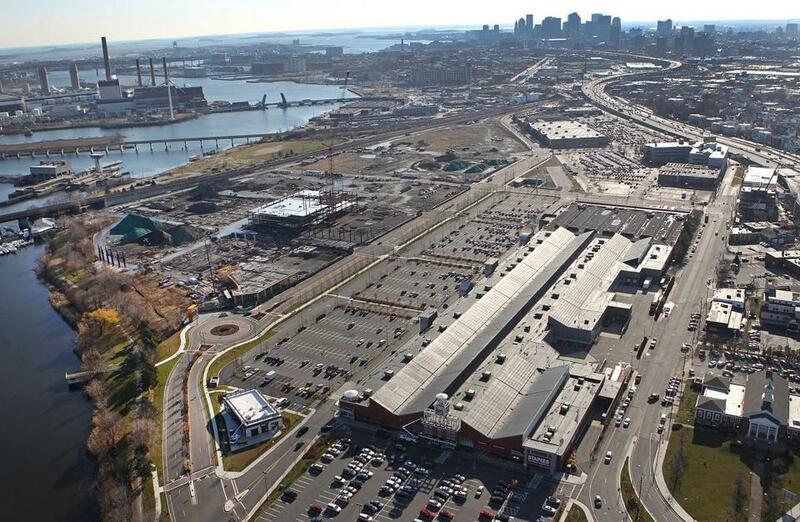 Mayor Joseph A. Curtatone of Somerville said the thousands of arriving Partners employees would be a catalyst for Assembly Row, creating traffic for the stores and restaurants opening there. Partners expects to occupy 650,000 to 700,000 square feet at the site. Curtatone said about $130 million in city, state, and federal funds have been invested over the past five or six years in Assembly Row, one of the largest mixed-use developments in Massachusetts. He said Somerville hopes to attract “spillover” from the high-tech and life sciences cluster in Cambridge’s Kendall Square, about 2 miles way. Many details about Partners’s new space on Assembly Row are still being negotiated, including the ownership structure of the office complex and whether it will include shops and restaurants, said Don Briggs, senior vice president at Federal Realty Investment Trust. The firm is developing Assembly Row as a $1.2 billion project on 45 acres of former industrial property along the Mystic River that once housed a Ford Motor Co. factory. Under an “initial conceptual plan,” he said, Partners will occupy two separate but connected buildings, one taller than the other, behind the Home Depot on a site once planned for Ikea, the Swedish furniture and homegoods chain that ultimately abandoned plans to move there. Partners also has reserved an option to take up to 1.1 million square feet in the complex, Briggs said. Assembly Row will have a total of as much as 2.5 million square feet of office space, including a 100,000-square-foot building already under construction on the Mystic River. The development will also include outlet stores, restaurants, hundreds of residences, a revitalized riverfront park, and a new Orange Line MBTA station. Developers already have lined up several high-profile retail tenants, including the Legoland Discovery Center, Nike, Brooks Brothers, French cookware maker Le Creuset, women’s clothier Chico’s, and the ice cream shop J.P. Licks. AMC Theaters is also opening a 12-screen cinema on the property.